Grains, a staple of life, are widely used in French cooking. Rice is served with dishes from roast chicken to grilled salmon and blanquette de veau. 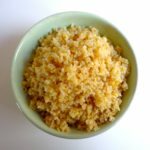 Couscous entered the French culinary repertoire during this country’s colonial period in North Africa, while bulghur made a more recent appearance, along with grains from America like quinoa and wild rice. This page is a work in progress. More grains will be added from time to time.